“The struggle is real,” is our snide mantra over laughable “struggles” like not having coffee in the morning. But real struggles do exist. Depression turns just getting out of bed into a war. The struggle for parents to love, guide, discipline, and direct children who want their own way. The battle to overcome addiction. Physical pain that debilitates. Watching a loved one finish their time on this earth. Loving well a person with dementia whose personality and memory is slowly fading away. Longing to do well so that your business succeeds for God’s glory. Working and praying hard to keep a ministry going. Doing what is right when it seems every corner you turn someone or something is against you. Struggles are real. So how can we live fulfilled when right now is a battle? The new. Every minute of every day God is doing something new. We just need eyes to see it, ears to hear it, and hearts and minds to perceive it. The struggle we are experiencing now is not always going to be. God is doing something. He is using this struggle to mold and shape us, to guide and direct us. He is doing something new in the midst of the battle. To live fully in the battle, we have to look for the new thing God is doing. Look for His presence, guidance, peace, wisdom, and grace. The not yet. God promises that one day all of these battles will be won. They will be finished and we will be at peace. There is a time coming when God will be living fully in our midst. Our sin will be gone and victory will be ours through Christ. This is our hope in the not yet. We are victors, but our victory is not yet complete. We can rest knowing our current uncertain battles have a certain end, victory in Jesus. The Gone. Some battles end and their effects still linger. They haunt our current struggles as we carry around labels like failure, unwanted, unloved. But God never intended us to carry those labels. Learn from our past, yes. Grow from our losses, certainly. But never be defined by them. Instead He wants us to forget so we can stretch forward. To live fulfilled in the midst of struggles we must forget the labels of the past and press forward through the struggles of today. We must let the past be gone and let God, our creator, fill us with His love, joy, peace, patience, kindness, goodness, faithfulness, gentleness, and self-control. He will fill us, we just have to trust expectantly in Him. 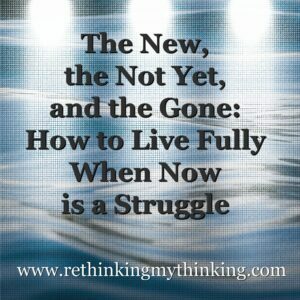 What do you need to do to live fully today, look for the new, remember the net yet, forget the gone? May the God of all glory, grace, and peace fill us with His Spirit so we can live fully now. Father give us eyes to continually look for the new thing You are doing. Remind us that we have a hope not only for this earth, but for eternity. May we forget what lies behind so we can strain toward what You have in store for us. Father fill us with You so we can live fully even while this life is hard. In Jesus’ Name we pray, Amen. 2018. A year of breaking. God broke my comfortable world. He called me to teach high school seniors (a leadership class), enroll my kids in the school where I work, and step back into nursing by becoming a school nurse. Nothing felt comfortable. Nothing normal. In the midst of all the change my brokenness became apparent. I couldn’t do it all. I couldn’t do it well. My house was periodically in shambles. I missed appointments, learned how much I did not know, failed my kids, snapped at my husband, and felt the stretching snapping breaking of change. 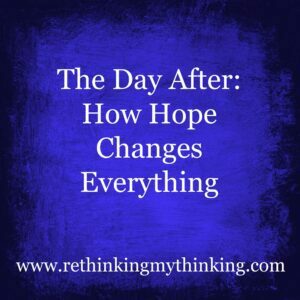 I wish I could say I embraced the change, grasped for grace as the cracks became evident. 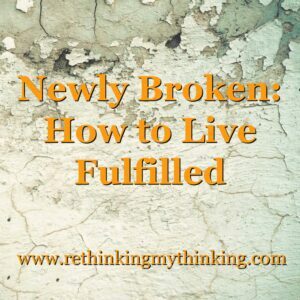 Instead I allowed the newness to deepen my brokenness. I gave into frustration. I knew the truth, but I didn’t want to admit it. I am not enough. I am broken. And yet, broken is where God wants me. Not so He can hold it over me or ridicule me, He wants me broken because when I am broken He can use me. In fact brokenness is what pleases God. When in our brokenness we turn to God, He will take those broken pieces and make something beautiful. Instead of broken vessels leaking purpose, joy, and hope, God makes broken people whole. He makes us whole so He can fill us with His Spirit, purpose, joy, hope, love. So how do we lived fulfilled? We bring our brokenness to God and He makes something beautiful and whole. We admit we are not enough, we cannot do it on our own. In our messy broken state God will fill us with hope, joy, peace, and His Spirit. May we all take our brokenness to God and exchange our emptiness for His fullness. I always thought imagination produced hope. Imagination that figures out a way through a difficult situation. Or an imagination that dreams big dreams. But God tells us character produces hope. Not just any character grows hope. 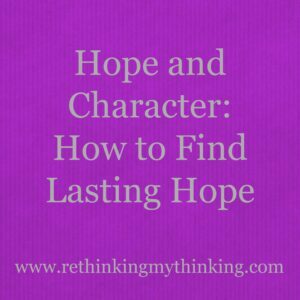 Only character developed in the crucible of suffering can result in hope. Endurance is the fertilizer for this type of character. Endurance brought forth in joy because we trust God who suffered so we could live with Him in eternity. And there is the hope. A new creation that God is still birthing new things in and through. Already a child of God, but not yet perfectly perfected. An already righteous saint, but still working out her salvation with fear and trembling. A secure heir, who longs to bring glory to my Father, but often falls short. This is what it means to have character that produces hope. Character that understands who God is and who I am. Character which longs to make much of God and invest the time and talents God gives to matter for eternity. Character that endures suffering for the joy that God promises us in eternity. Character that doesn’t lie or take the easy way, but instead does what is right. Character that loves others, walks humbly, and admits mistakes. Jesus died. His heart stopped beating, his lungs stopped breathing. They buried him in a tomb and there he stayed for three days. And yesterday we celebrated His resurrection. His amazing triumph over sin, death, and hell. For those who do not believe in Jesus, this sounds crazy. And as a nurse I agree. People do not suddenly break out of the morgue or their tomb after three days. But Jesus was more than a man, He was God too. His victory over death gives us hope that we – who believe in Jesus’ offering and humble ourselves under His Lordship – do not have to fear death. Instead we look forward to an eternity with God. The resurrection gives us hope that no situation is beyond hope. We cannot lose because we know that God has great plans for us. This certainly doesn’t mean life will be roses and easy. What it does mean is that God has a plan and purpose that we may never see or understand. And the resurrection whispers hope. Hope of healing physically or in eternity. Hope that broken things can be made beautiful. Hope that relationships can be mended. Hope that God knows best. Hope that God does not waste tears or pain, but will bring about His perfect glory through it all. So we hope in Christ alone. We hope in His perfect ways and trust His time because He is our resurrected Lord.